A study by grid operators shows that an aggressive growth in wind energy generation by 2024 would need hefty investments in transmission lines. Meanwhile, a Michigan company proposes a $10 billion project. A boost in wind energy generation in the eastern half of the United States will require roughly $80 billion in new transmission lines by 2024, said major electric grid operators Monday. If the country wants 20 percent of its electricity from wind – or an additional 229 gigawatts of wind energy capacity – then it will need to build 15,000 miles of new transmission lines. That cost doesn't include the $1.1 trillion that will be needed to build wind power farms, said the grid operators in a report (see executive summary). If the country gets only 5 percent of its electricity from wind by 2024 – or an additional 60 gigawatts of wind energy capacity – then the grid needs to add about 10,000 new transmission lines costing roughly $50 billion. The cost of building wind farms could reach $700 billion. Wind energy accounted for less than 1 percent of the country's electricity supply in 2007, according to the federal Energy Information Administration. Overall, 7 percent of the country's electricity supply in 2007 came from renewable sources, with a bulk of it coming from biomass and hydroelectric generation. The report was a preliminary assessment by grid operators to determine what the grid should look like to meet a growing national demand for renewable energy. President Obama has called for the country to double its renewable energy production in three years, a goal meant to create new jobs while moving the country away from building more coal-fired power plants. The consortium is made up of Midwest ISO, Southwest Power Pool, PJM Interconnection, the Tennessee Valley Authority, Mid-Continental Area Power Pool and power companies within the SERC Reliability Corp. The study also looked at New York and New England. The nation has seen an explosive growth in wind power, which is considered by some utilities to be cheaper than solar. The United States overtook Germany as the world's largest wind energy producer in 2008. Texas leads the nation in wind energy generation, and currently has about 7.1 gigawatts in capacity, according to the American Wind Energy Association. The grid hasn't improved as quickly as the growth in renewable energy growth in some regions of the country, however. In Texas, grid congestion isn't uncommon, and state regulators recently approved $5 billion worth of transmission projects (see Texas Wind Farms Paying People to Take Power). Several other power companies throughout the country also recently announced transmission projects. Ratepayers typically end up paying for this type of projects, and approval for rate increases often must come from states. With renewable energy generation receiving popular support from state and federal lawmakers, as well as the public, getting those rate increases approved could prove easier under the current political climate. Of course, there is no assurance that building new transmission lines for ferrying wind or solar power would get strong public support. The California Public Utilities Commission approved a controversial, $2 billion project last December after three years worth of hearings and debates over where those transmission lines would be located and whether the utility in question would even use the lines for renewable energy (see California OKs Controversial Transmission Project). ITC Holdings Corp. on Monday proposed a project to build 3,000 miles of extra-high voltage lines (765 kV) to ship wind energy from North and South Dakota, Minnesota and Iowa to other Midwestern states. ITC, based in Novi, Mich., said the project would cost an estimated $10 billion to $12 billion. ITC said the project would be adequate to move 12 gigawatts worth of wind power. The U.S. Department of Agriculture last week said he had aside $356 million for rural utilities and cooperatives to upgrade their transmission networks. Some of those new capacities would be used to support wind and other renewable energy developments (see Farmers Need a Better Grid, Too). The USDA is giving $356 million in loans to rural utilities in 10 states to upgrade their transmission networks. It's not just the large power companies that are keen on adding new transmission lines to ferry renewable energy to cities and suburbs. Rural utilities also are looking for money to upgrade their local grids, and the U.S. Department of Agriculture is there to help. The USDA said Friday it has awarded $356 million in loans to 16 rural utilities and cooperatives in 10 states for adding or fixing 3,830 miles of transmission and distribution lines. All together, the projects would benefit 45,000 customers. The Western Farmers Electric Cooperative will receive the largest loan. The co-op, based in Andarko, Okla. but serves customers in Kansas and Texas as well, plans to use the $103.3 million to build 120 miles of new lines, three switching stations and 10 substations. It also wants to upgrade 38 existing substations and switching stations. The cooperative said last month it had begun getting electricity from a 19-megawatt wind farm developed by the Edison Mission Group, part of Edison International (NYSE: EIX). The cooperative said it is looking at adding another 100 megawatts to 200 megawatts of wind energy to its supply. Other USDA loan recipients included the Victory Electric Cooperative Association in Dodge City, Kan., the Central Alabama Electric Cooperative in Prattville, Ala., and the Piedmont Electric Membership Cooperative in Hillsborough, N.C. Many renewable energy advocates have called for boosting the country's electric grid, given the growing demand for electricity, particularly from renewable sources such as sun and wind (see Al Gore Sets Energy Goal and National Grid: Dream or Reality?). And many of the large solar and wind farms are located far from metropolitan areas, prompting power companies to spend billions to expand their transmission capacities (see California OKs Controversial Transmission Project). Last week, Texas regulators approved $5 billion worth of transmission projects to a dozen power companies. Texas, the country's largest wind energy producer, has experienced severe grid congestion because its transmission isn't adequate in accommodating the growth of wind energy generation. Wind farm operators from western Texas have paid the grid operator to take power they produce in order to take advantage of a lucrative federal production tax credit (see Texas Wind Farms Paying People to Take Power). MAMMA MIA! The adaptation of the Abba musical, starring Meryl Streep and Pierce Brosnan, has taken more than $500m worldwide since its July release date. aXXo posted his DVD-quality version online on 15 December. Labels: aXXo, bittorrent, Bootleg Movies, Bootleggers. Lucas attended college at the University of Southern California, although he grew up around the Bay Area of San Francisco, and returned there not long after he finished school. He’d return to Hollywood frequently to work, and in 1973 after the huge success of American Graffiti (it cost $1.25 million dollars to make, and grossed over $115 million), Lucas found himself with $4 million dollars in cash and spent $150,000 of that on his first secret lair: Park Way. This was a home found by Lucas’ first wife Marcia, who dubbed it ‘Parkhouse’, and was located in Marin County, in the tiny city of San Anselmo. It was a sprawling Victorian house, designated as a Marin landmark, and Lucas turned the house into a complete workstation: the bedrooms became offices, they installed an editing bay in the attic, and had a screening room built in the back. It was only a short drive from Lucas’ much smaller house in San Rafael to Parkhouse, and it became a refuge for both him and his friends. A place to work without interruption, and the de facto offices for Lucasfilm, Ltd, which was established in 1971. Lucas had a “writing room” built at the back of Parkhouse, and he holed himself up for eight hours a day there writing Star Wars. Once that became a surprise smash-mega-ginormous hit, he had enough money to begin building his real empire. 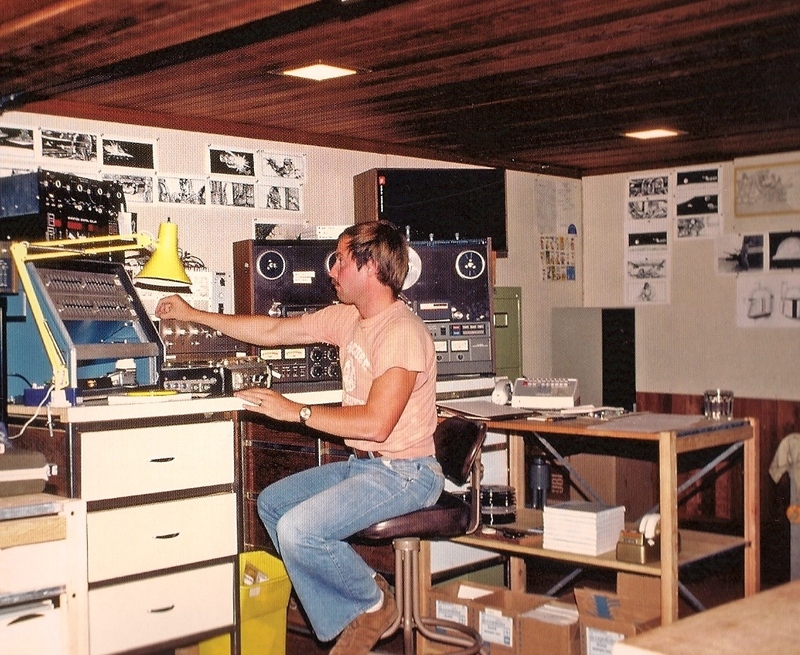 Over the next several years, while making Star Wars sequels and working on Raiders of the Lost Ark, Lucas kept quietly putting things together at the ranch, now dubbed “Skywalker.” Although what’s interesting is that he almost never bought the property. When he was originally looking at sites, he didn’t like the fact that the road leading out to it was called “Lucas Valley Road,” and thought that it would be a beacon for fans to follow to his front doorstep, especially since it has its own freeway exit. The road was actually named after a rancher who lived in the 1880s, and Lucas eventually came to terms with it. After all, who wouldn’t want to live on a road bearing their own name? 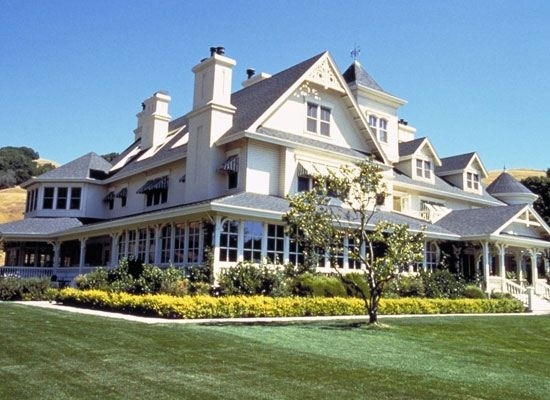 The process took time, however, and Skywalker Ranch didn’t officially open as a working facility until 1987, nearly ten years after Lucas had submitted the original plans. Lucas worker bees were busy constructing an entire working set of buildings, disguised as ranch houses, barns, and so forth. A vineyard was set up on the property, animals were brought in, trees were planted, and Lucas supposedly wrote out an entire fictional history for the people who had built the property. Does that mean there’s a Skywalker Ranch: The Movie possibly coming some day? A change of genres and settings might be good for you, George. As Lucas acquired neighboring ranches and pieces of land, he also scooped up Big Rock Ranch (seen above) which was used to expand the working space at Skywalker. Last year members of the press (including yours truly, who was lucky enough to be included) were flown out to Big Rock which at the time was housing the Lucasfilm animation department, who were all busy working on The Clone Wars. You can check out my Flickr photo album from that trip here, which includes a photo of the original door to The Kerner Company - Optical Research Lab. This was a fake name to keep people from trying to pry secrets out of Industrial Light & Magic. 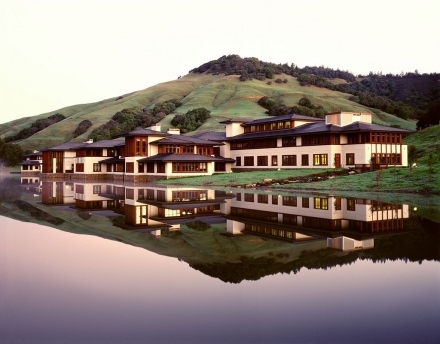 Skywalker Ranch also houses Skywalker Sound, which is one of the main reasons most filmmakers take the time to trek out to Marin County to work on the the sound design for their films. Skywalker Sound originally started as Sprocket Systems and was based in San Rafael in shared office space with ILM, although they changed their name after The Empire Strikes Back came out, and eventually moved out to the Ranch once the buildings were complete. They occupy the entire Technical Building on the Ranch property, which is 155,000 square feet. They’ve won 18 Academy Awards, and probably don’t come cheap. As you’d expect, Skywalker Ranch is a pretty amazing place, with tons of amenities besides the picturesque views and rolling hills. Check out the list and fun other stuff that you’ll run into on the ranch. Besides all of the work buildings, Lucas also constructed an observatory on-site to house a large telescope sent to him by a Star Wars fan. In additon to the working building, there’s also a motel, four restaurants, a day-care center, and fitness center on the property. In case you were wondering, there’s a free continental breakfast provided daily. Although I imagine if you can afford to book Skywalker Ranch, you’re not worried about the price of a muffin and a glass of juice. 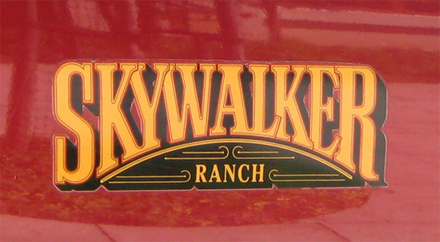 The Ranch also has its own fire department, whose trucks are emblazoned with the word “Skywalker” on the sides. They often help with fires in the Marin County area. Lucas went to great length to make sure that it’s difficult to see the buildings from the main road, and has also hidden most of the parking structures underground. As you’d expect, Lucas has an on-site security team with extensive surveillance over the entire property. Supposedly he’s extremely terrified of being kidnapped. Probably more so after the invention of Jar Jar Binks. 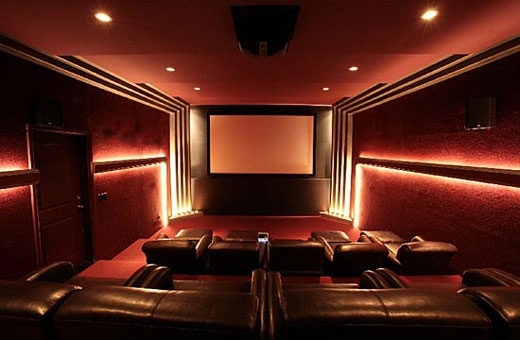 The Ranch has it’s own screening room, a 300 seat state-of-the-art theater called “The Stag.” It’s one of the most sophisticated theaters in the world. 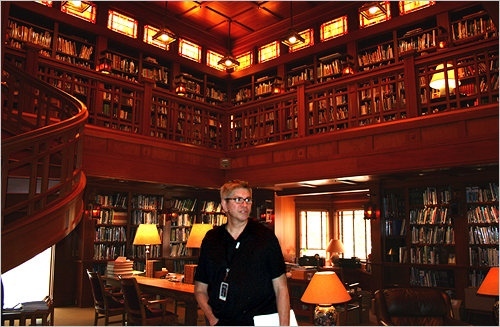 One of the coolest places on the ranch is the Skywalker Library, which is a two-story research center that provides archives and research to filmmakers. Lucas’ inner sanctum at the Ranch, located in the main Victorian-style building, houses artifacts like the original lightsabers from Star Wars, Indy’s battered and dusty fedora from Raiders of the Lost Ark, and… Howard the Duck’s electric guitar. Currently, the Ranch sits on almost 5,000 acres, most of which is undeveloped. 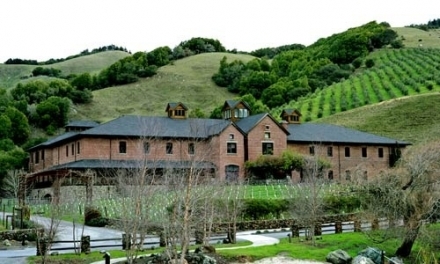 Although Skywalker Ranch might very well be Lucas’ Xanadu, he still considers it “a nice, contemplative environment, which I need to think.” Which probably makes it one of the most expensive writer’s retreats in the world. It’s estimated that Lucas has spent hundreds of millions of dollars on the Ranch, and if or when he’s ever finished with it, what will happen to it? In all likelihood, he’d donate the property to a local college, or maybe gift it to USC as a film center. Lucas have been very generous in giving USC money since graduating, and in return they named the George Lucas Instructional Building after him. For now, the entire place remains one man’s empire. Hopefully it will start being used for more good, and less evil. 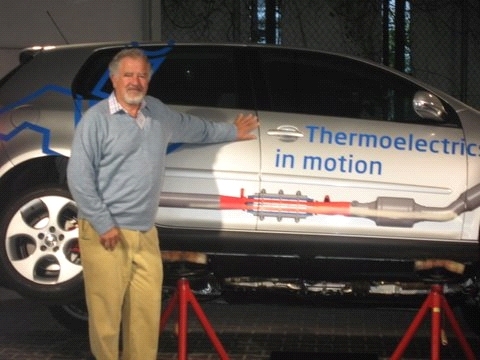 The International Thermoelectric Society website reported that Volkswagen showed a prototype vehicle equipped with a thermoelectric generator, recovering the dissipated heat energy and converting it into electricity. The prototype has been shown at the “Thermoelektrik - Eine Chance Für Die Atomobillindustrie?” meeting held in Berlin in October 2008. Purportedly the thermoelectric generator is able to gain about 600W from a car running on a highway, meeting about 30% of the car’s electrical consumption requirements. For the moment, the thermoelectric generators haven’t been embedded in a hybrid car, although VW says with the current setup it can save about 5% of your fuel consumption (not 5L/100km, but 5% of 5L). BMW and DLR (German Aerospace) also competed with Volkswagen by showing a system with a 200W output. They say it has been used for more than 12,000 km. They are both integrating TEGs with future gasoline powertrains. BMW even has them in their plan for the 2010 - 2014 Series 5 cars. These are nice innovations. If used properly in a hybrid car, this type of systems could charge the vehicle’s battery, fact that would be much more useful than only at those times when air conditioning and lights are being used. With the press all in town for the New York Comic Con, Activision took the opportunity to walk us through the latest build of id and Raven's new Wolfenstein. It was a good chance to get a sense of how the game plays out through the first few levels. As you've likely heard by now, our hero B.J. Blazkowicz is back for another FPS in set in a WWII fictional German city. Though, this is time around it's a much more fleshed out experience -- some of your supporting NPC characters help narrate your story. For lots of people, the first thing that comes to mind when it comes to Wolfenstein is zombie Nazis. I didn't see any of those today (we only saw two levels, so maybe they'll show up later), but I did get a chance to get a better sense of how the game's weapons and special powers work. B.J. 's introductory mission sees him at the destruction of a train containing an unknown Nazi experiment -- the premise behind the sci-fi elements within the game. During his battles, the environment periodically loses its gravitational pull, sending rubble and unsuspecting Nazis floating into the air. For whatever reason, this has no affect on our protagonist, who remains firmly planted on the ground while continually shooting at the now vulnerable and motionless enemies. It would be nice to witness the villains flailing around while spraying bullets from their weapons -- I mean, the game makes it obvious that they're still alive because when gravity sets back in, they stand right back up and fight -- so why would anti-gravity place them in a lifeless state? But maybe there's a good reason that I missed. Anyway, it's not quite as appealing to kill unresponsive and defenseless enemies while they're seemingly floating on cloud nine, but I assume this only for that part of the game, since this never occurred in the "Church" level, a third of the way into the campaign. Somewhere between the first level and Church, B.J. discovers a Veil Amulet, a device that gives him access to the Veil dimension. In this dimension, the environment around you retains its shape and form, but everything has a shade of green coating; the combat with the Nazis still persists although they and B.J. are in two different dimensions. And from what I was told, the Nazis don't have access to the Veil, but are continuously seeking the energy that comes from it called the "Black Sun," the focus of their experimentation. Click the image above to check out all Wolfenstein screens. The Veil Amulet has an energy meter that is drained during use. It slowly regenerates over time, but to quickly fill the meter back up, you can find pools of Veil energy. This can be done easily with the help of Geist creatures -- floating bugs that are always gravitating towards the energy pools. The Geist creatures can also be useful during combat; if they are near a Nazi, shooting them will unleash Geist energy, sending out what looks like an electric current that kills the enemy. Now, the Veil Amulet has its uses for combat; one such example is that B.J. will unlock powers in the duration of the campaign that are only usable in the Veil dimension. During the demonstration, I noticed that the Amulet has four round stones, and only one of which looked activated. While in the Veil dimension, console players will have a power designated to a direction on the D-pad. So I'm going to go on a whim here and assume that only four powers total are unlockable. The single power Activision was willing to show during the Church level was Mire -- an ability to slow down time. In addition to the Amulet having unique powers, the Veil dimension will also grant B.J. access through walls that have a Black Sun symbol on it -- giving him the ability to surprise the enemy (maybe puzzle elements will also be included in the campaign). Another important use the Veil dimension provides became apparent when B.J. fought a Heavy Trooper (the Heavy Trooper is the product of Nazi experimentation -- a heavily armored soldier equipped with a Particle Canon, which channels the veil energy into a deadly laser). The Veil dimension revealed the enemy's weak spots by highlighting them in a red hue. After destroying enemies, B.J. gets to keep the weapons he acquires in his inventory. Upgrades can also be purchased, although the details of how were not revealed. Also, multiplayer is going to be available, but it remains a mystery as to how the Veil Amulet and such will be implemented in that. Wolfenstein is using id's Tech 4 engine, is being ported to PC from console, and carries a release date of "when it's done." We suspect it'll be out late this year. For more info on the game, make sure to check out our recent interview with the game's creative director. WASHINGTON – The Food and Drug Administration made history Friday as it approved the first drug made with materials from genetically engineered animals, clearing the way for a new class of medical therapies. GTC Biotherapeutics said regulators cleared its drug ATryn, which is manufactured using milk from goats that have been scientifically altered to produce extra antithrombin, a protein that acts as a natural blood thinner. The drug's approval may be the first step toward new kinds of medications made not from chemicals, but from living organisms altered by scientists. Similar drugs could be available in the next few years for a range of human ailments, including hemophilia. About 1 in 5,000 people don't produce enough antithrombin protein, according to Framingham, Mass.-based based GTC. As a result, their blood is more likely to stick together, occasionally causing clots that can travel to the lungs or brain, causing death. Pregnant women with the disorder are at higher risk of miscarriage or stillbirth, because of blood clots in the placenta. Patients with hereditary anithrombin deficiency are currently prescribed conventional blood thinners, like Plavix from Bristol-Myers Squibb and Sanofi-Aventis. That will not change with the new approval. ATryn is only approved for use when patients are undergoing surgery or having a baby, times when the risk of dangerous clots is particularly high. Those patients would receive the drug by intravenous infusion for a limited time before and after their procedures. To make the drug, scientists at GTC put DNA for the human antithrombin protein into single cell embryos of goats. Goat embryos with the gene were then inserted into the wombs of surrogate mothers who gave birth to baby goats that produce the protein-charged milk. Genetically engineered animals are not clones but rather animals that have had their DNA changed to produce a desirable characteristic. Amid growing questions about the technology, the FDA last month issued guidelines for how it will regulate products made from genetically altered animals. FDA said it will not allow any such products to be sold without first submitting them to scrutiny by independent advisers at a public meeting. The agency's panel of blood product experts recently concluded ATryn was safe and effective. But consumer groups said the FDA's long-awaited policy will not require all genetically engineered foods to be labeled as such. And they said the government has not done enough to examine the potential impact of genetically engineered animals on the environment, particularly if some escape and begin to mate with animals in nature. The drug received European approval in 2006. Shares of GTC Therapeutics rose 5 cents, or 5.5 percent, to 87 cents in midday trading. AP Business Writer Matthew Perrone contributed to this story. BARSTOW • M.J. Somers said he wanted to live by the law — and that’s why he got his medical marijuana permit. But Somers, who has a doctor-issued license to carry up to eight ounces to treat chronic what he calls “chronic muscle pains and seizures,” said he felt like criminal when he was stopped by Barstow sheriff’s deputies on Route 66 in early January. During the traffic stop, deputies confiscated close to an ounce of medical-grade marijuana Somer said he had just purchased from a clinic in Los Angeles. In a Barstow courtroom on Jan. 29, Judge Steve Mapes ordered the marijuana’s return after Somers presented his legal permit. Somers said Mapes cited a similar case in Garden Grove in 2005 where a district court ordered the return of one-third of an ounce of marijuana police had confiscated in a traffic stop. An appeal by Garden Grove officials was refused by the U.S. Supreme Court in 2008. Mapes could not be reached for comment. Somer’s case highlights a conflict for county law enforcement agencies, according to Lt. Rick Ells, a spokesman for the San Bernardino County Sheriff’s Department. The county is currently challenging a state law that requires it to issue legal identification cards to medical marijuana patients, claiming that doing so would violate federal law that prohibits marijuana use. “Our deputies ... [that] are sworn to uphold both federal and state laws are faced with a dilemma as to which law to enforce,” Ells said. Ells said he could not comment on Somers’ specific case because he had not yet seen a copy of the court order. People stopped by county deputies in possession of the drug will have it seized and receive a citation, Ells said. Deputies will document the existence of the medical marijuana card in the report they send to the district attorney, who decides if the case will be pursued, he said. The resistance to medical marijuana at local levels of government and law enforcement is dwindling, according to Kris Hermes, spokesman for Americans for Safe Access, the Oakland-based medical marijuana advocacy group that represented the Garden Grove man. 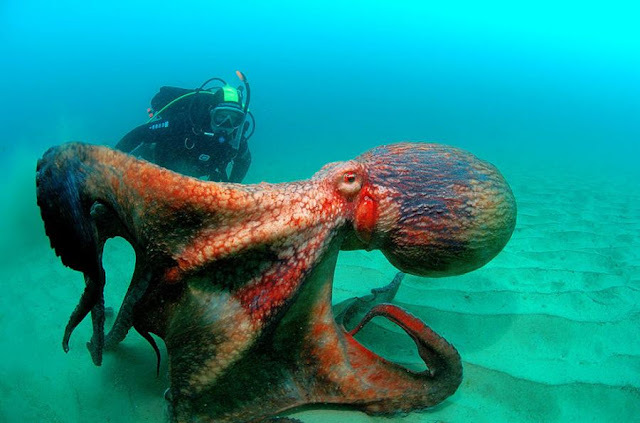 Pun intended: it does look like nothing until you approach really close, then it springs at you (morphs at you, intimidates and astounds you, you pick the right verb) Here is a video that most tellingly shows how some unassuming clump of weed on a rock can grow tentacles in a matter of moments. As anyone who has read or written one of the several million lists of “25 Random Things About Me’’ posted on Facebook knows, the things may number 25, but rarely are they random. Point either the Dodge Charger SRT8 or Pontiac G8 GXP down the road. With a light touch on the brakes, run the revs up a bit. Slip off the brake and bury the throttle. There's a light chirp as tires scratch for bite. Then comes a sub-5.0-second sled ride to 60 mph. A tick over 13.0 sec. and you're through the quarter-mile. It's a rush, of course, but not overly dramatic. Try the same thing with this pair's predecessors of 1970 or so and you'll find yourself in a bit of a wrestling match. Ain't progress wonderful? Maybe yes, and maybe sometimes it's fun to wrestle. Just saying "Charger" and "Hemi" will get you a free six-pack in some neighborhoods. And well it should, whether from a young driver loving his new Hemi or his old man (heck, maybe his old man's old man) getting nostalgic about the original Hemis. It has been 58 years since the first hemispherical-combustion-chamber Chrysler V-8. Today's Hemi isn't as hemispherical as its ancestors and we miss those broad cylinder heads and their rocker covers. Still, the new Hemi is a powerful-looking piece, plastic panels with "HEMI 6.1L" hiding heads that sport ugly coil-on-plug electronics. Look beneath the cast-aluminum intake manifold and you'll see the classic orange paint on the engine block. The Charger's aluminum fuel-injected V-8 puts out 425 bhp at 6200 rpm and 420 lb.-ft. of torque at 4800 rpm. That horsepower number matches the advertised output of the carbureted cast-iron 7.0-liter Hemi of the early 1970s. The modern Hemi, however, meets emissions and mileage standards thought impossible 35 years ago. Incidentally, Dodge does not use fuel-saving cylinder deactivation for the SRT8's 6.1-liter V-8. Just saying "small-block" brings to mind a fabled engine line, one that has produced over 90 million V-8s since 1955. It's said there are only two constants in the universe, the speed of light and the bore centers of a small-block Chevy. The GXP's LS3 V-8 is true to that tradition. Displacing 6.2 liters in the GXP, the all-aluminum V-8 is rated at 415 for both horsepower (at 5900 rpm) and lb.-ft. torque (at 4600 rpm). Like the Hemi, the GXP LS3 doesn't use cylinder deactivation. While those GXP power numbers are impressive, you wouldn't necessarily guess it when you lift the hood to face a plastic panel that hides the engine. This camouflage is pretty enough, but we miss seeing the actual hardware. While Dodge's SRT8 example of the modern All-American muscle car is built in Canada, Pontiac's G8 GXP is sourced from Australia via GM's Holden division. Any American motorhead could easily talk with an Aussie counterpart right down to the specifics of eking more power from small-block Ford and GM V-8s. We talk in horsepower and pounds-feet, they prefer kilowatts and Newton-meters and drive on the wrong side of the road, but otherwise the language, the basic equipment and the passion are the same. Just don't slip, let the accent confuse you and ask them if they're from England. Or New Zealand. They hate that. Thankfully, down in Oz they never liked front-wheel drive for their powerful vehicles and never tried such odd combos as the Pontiac Grand Prix GXP with its 5.3-liter V-8/front-drive powertrain. Reminds one of the time Bill Veeck pinch hit a 3-ft. 7-in. midget to draw a walk against the Tigers. The ploy had its intended effect, but isn't remembered as great baseball. Holden's adherence to rear drive is why the company got the Zeta platform program, which evolved into the General's "Global RWD Architecture." Prospects for this program are hazy these days, but the Zeta is the basis for the Pontiac G8 and Chevrolet's new Camaro. Specifically, that means MacPherson strut front and 4-link independent rear suspension with stability control, designs tweaked at the Nürburgring, a first for a Pontiac. Brembo supplies the front brakes, with ventilated rotors on duty inside alloy wheels shod with P245/40R-19 tires. Pontiac was able to cherry-pick from the Holden Commodore line to create the GXP. There's a lot from which to choose, including wild versions done by Holden's Special Vehicles group. But Pontiac passed on tall tail wings and large fender vents. Staying conservative, it based the GXP on the Commodore Calais V-Series, onto which was grafted a nicely done Pontiac twin-snout nose and a unique air-scoop hood. One look is all it takes to identify the Charger as a Dodge. That gunsight grille is as recognizable as Jay Leno's chin and looks as though it might take a bite out of you. Work your way rearward to the broad shoulders over the rear wheels and the shape stays powerful, like muscled arms from a sleeveless sweatshirt. An aggressive front spoiler, hood scoop, rear wing and 5-spoke alloy wheels add to the image. There is a version with Super Bee striping, but we'd opt for the standard SRT8's stealthiness. Like the GXP, the Charger has foreign roots, the chassis an E-class hand-me-down from Daimler and one of the best aspects of the SRT8. That would be Merc's upper and lower A-arm front suspension, the 5-link independent rear design and the Electronic Stability Program. The red Brembo calipers on all four vented discs are quite visible through the wheels fitted with 245-width front and 255-width rear tires. That chunkier shape of the Charger makes it look larger, and it is. Overall it's 4.0 in. longer and on a 120.0-in. wheelbase versus the Pontiac's 114.8. Although the Charger is 0.3 in. narrower, the two cars have identical heights and almost identical \tracks. As befits its generally larger size, the Charger outweighs the GXP by 185 lb. Still, by EPA measurements the interior volume of the GXP is greater than the Charger's. And that's felt in the rear seat area, where Pontiac comes out ahead. Ditto with luggage space. Layouts of the dashboards of the two cars are similar, from readable four-dial instrument panels to the placement of navigation/audio/climate-control panels to rotary headlight switches to their steering wheel switchgear. Both are good-looking displays, but the Dodge's is a bit less fussy than the Pontiac's. You can tell the GXP's design is not GM-Detroit. When would they use roller knobs for seatback angle and spec a Blaupunkt radio? These differences add to the Pontiac's imported aura...a hint of BMW or Audi? We think the dashboard of the Dodge has a more solid look. The Pontiac's display requires more pieces, being built as left- or right-hand drive — hence the center console-mounted window switches — and doesn't have that carved-from-one-piece look. And we love the Charger's in-dash test computer that will read out 0–60 and quarter-mile acceleration, lateral and longitudinal g's and braking distances. Thankfully, it has a memory or you might find yourself sliding off into the bushes while being charmed by the dial. Managing Editor Andy Bornhop and I were split on the seats — he liked the manner in which the big side bolsters of the Charger's seats hold you in place, while I preferred the slimmer style of the GXP's buckets. To each his own, both seats being comfortable for the several days we were in the cars. There's no denying the rear seat of the Pontiac is more spacious than that of the Dodge. GXPs can be ordered with a Tremec 6-speed manual transmission and SRT8s can't. Both our test cars, however, had automatics, five speeds in the Dodge, six for the Pontiac. Each has manual-select gates and we still prefer the Dodge's left-right gear selector over the Pontiac's fore-aft system. Then again, the Pontiac's automatic is more in tune with the driver, matching revs on downshifts. Running through those gears, the G8 just barely beat the Charger, the score in seconds to 60 mph being Pontiac 4.7, Dodge 4.9. The margin slimmed to 0.1 sec. though the quarter-mile, the Pontiac running 13.1 sec. at 109.4 mph, the Dodge 13.2 at 108.8. While the LS3 does its work with a strong, healthy exhaust sound, the rumble of the Hemi is enough to make any V-8 lover weak in the knees. op speed of the Charger is claimed at 165 mph, while the GXP's is electronically set to 155 mph, thanks to its tires. Braking distances were also remarkably similar, within a few feet of each other from both 60 and 80 mph. And with Brembos on duty in each car, there was no question of stability or fade problems. This is getting too even-steven. Heck, both cars even have MSRPs hovering near $40,000. So perhaps you're expecting a difference around the skidpad and through the slalom, right? Sorry, no luck. Both cars generated 0.88g, while the difference in slalom speeds of 65.0 mph for the GXP and 65.8 for the Charger is not that significant. Then again, how the pair went through the slalom underlined a major difference between these rivals. Rush the Charger through the cones and you'll find it corners flat and planted, with little body roll and moderate understeer. Do the same with the Pontiac and it's a different story, leaning at each gate with the back end wanting to work its way out. Hustle the Charger down two-lane canyon highways and you'll be aware of its wide footprint and just-heavy-enough steering. There's light understeer, but it increases driver confidence, especially as you pick your way along unfamiliar roads. With the GXP, body roll is more abundant, and the steering feels almost too light — with limits less certain. Nevertheless, the Pontiac is great fun on the road, more alive and willing than the Dodge. In short, the Dodge gives you a greater feeling of security on a hard drive, but you can go faster in the more agile Pontiac. As you might expect, neither car has a boulevard ride — Bornhop calls it "the firm side of acceptable" — but given their performance potential they are quite livable for long hauls on all but the roughest surfaces. As a senior member of the R&T staff, one who had the pleasure of road-testing the original muscle cars in their day, I love the Charger-G8 duo for a pair of reasons. First, quality. Simply, the G8 and Charger are very well built and the originals weren't. Today's duo has the sort of build quality even many luxury cars lacked in the muscle-car era. Slim, even body gaps, smooth paint, good materials, reliable parts and pieces, and not a squeak to be heard. Second, that sense of quality also comes across in the driving. Whether you prefer the more Euro style of the GXP's handling, as I did, or take Bornhop's side with the more American approach of the SRT8, both are fun. Or, once you've parked the cars for the night, you can think of the GXP as a fine Australian Shiraz, the SRT8 a quality American beer. Should you get too ambitious on the road in either car, stability control is ready to save your bacon, backed up by airbags and other safety systems. The V-8s are not just powerful and clean, but also darn reliable. Ditto with the transmissions. The pair's predecessors were a hoot in a straight line. But once the road began to shuffle left or right, they were not. These are. But one note of caution: If the Charger SRT8 or G8 GXP tempts you, keep in mind they may not be around two years from now. There are new Chrysler 300s and Dodge Chargers planned for 2011, but the automaker's very existence is in jeopardy. Even in a best-case scenario, stricter CAFE demands will put the squeeze on the Hemi. GM's plans already limit G8 sales in the U.S., and with rumors swirling of a major switch back to front-wheel drive for many GM 4-doors, a future rear-drive muscle sedan seems a bad bet. We can only hope the public will realize just how good these current cars are. 4.7L Aston V8 Vantage- Is it the Best Aston? Forget the DBS. Seriously. Compared with that V-12-powered moviestarmobile, the 2009 Aston Martin V8 Vantage -- updated with a newly enlarged, more potent V-8 -- is easily as quick, lighter and nimbler, and arguably every bit as good-looking. Yet the Vantage sells for about half the price. That's the story in a nutshell: If you're shopping for an Aston, we've just saved you about $140K (we accept 10-percent honorariums for our services; please mail checks to "Those Americans at the Bar," c/o Grand Hotel du Cap-Ferrat). A larger question remains, though: Do you really want this Aston at all? The last time we tested a Vantage (April 2006 -- a head-to-head matchup against the Porsche 911 Carrera S), we praised its pizzazz but wanted more power from the 4.3-liter V-8 (rated at 380 horsepower). Aiming at Aston CEO Ulrich Bez, we asked, "Is there room to bore that baby out a couple mils, Dr. B?" Apparently, Dr. Bez heard our query -- and listened -- because the new V-8 gets those bored mils (and additional stroke, too): The 32-valve V-8 now displaces 4735 cc. Horsepower climbs to 420 at 7000 rpm, torque to 347 pound-feet at 5750 rpm (versus 302 at 5000). Also upgraded are the six-speed manual and Sportshift automanual transmissions; changes include a lighter clutch and flywheel (which also reduces pedal effort on the manual) and, on Sportshift, a smarter computer that automatically holds the selected gear if it detects cornering inputs at the steering wheel. Underneath, a newly available Sports Pack adds lightweight forged alloy wheels (19-inchers are now standard on all models) plus stiffer springs and shocks, trading some body roll and ride cushion for flatter cornering and quicker response. We ran two V8 Vantage test cars at the track, though not by choice. The first, seen here in the photos, carried the six-speed manual transmission. Around town and during a brisk mountain drive, the manual compiled a compelling case for itself, proving quick and precise as it sliced-off healthy servings of torque from the sizzling V-8 up front. Then, after a single warm-up run on the dragstrip, the shift lever suddenly fell limp. Apparently, says an Aston spokesperson, the linkage had somehow disconnected from the shifter. Bottom line: The car disappeared on a flatbed, never to return. Nonetheless, on its first run the Aston had clocked a 0-to-60-mph time of 4.1 seconds and a quarter mile of 12.5 seconds at 115.0 mph, easily bettering the 4.3-liter car's performance (5.2 seconds; 13.6 seconds at 105.8 mph) and even topping the times of the mighty, 520-horse DBS with six-speed automatic (4.2 seconds to 60 mph; 12.6 seconds at 112.3 mph in the quarter). And the Vantage hadn't even revealed its full potential. "Definitely could've gone quicker," said test driver Scott Mortara. "Probably under four seconds to 60." We'll never know. Unable to repair the broken transmission in time for this review, Aston instead served up another test car, this one equipped with a six-speed, dual-clutch, paddle-shift automanual. First, the bad news: Around town and in spirited driving, the auto-clutch transmission was no match for the full manual, proving both sluggish and clunky. And now the really bad news: The auto-clutch car wouldn't allow an aggressive track launch. Instead, it simply attempted to roast its clutch. Opting to spare the car from self-flagellation, we recorded no additional timed runs. Does the new Sports Pack pay handling dividends? Why, yes: The new Vantage circled our figure-eight course in 24.5 seconds at 0.79 average g, compared with 25.7 seconds at 0.72 g average for the outgoing car. So, yes, in some ways Aston has upped its game. There's no denying the Vantage's rarity and beauty (lined up with the 911, it looks like a leopard next to an ostrich egg). Nor are there many engines on the planet whose exhaust note alone can convince you that $136,630 is an entirely reasonable sum to pay for an automobile. It's this timbre -- the V-8's nerve-chilling shriek above 4000 rpm -- that inspires the phrase "the sound of ripping silk." Of course, that's really just another hackneyed auto-journalism cliche. Besides, what the Vantage's V-8 really sounds like is a ripping silk-and-mohair blend. But...You knew there'd be a "but," didn't you? Before you run out to buy the "discount" Aston Martin, consider these factors. The transmission woes aren't reassuring (in comparison, we've run Porsches all over the world without so much as a shifting hiccup). And then there are...the annoyances. The sport seats are so spine-unfriendly they should come with free massage coupons. The shift paddles, mounted on the column, are so small that with the wheel turned only slightly you have to move your hands to reach them. The flip-up nav screen shows only nav info; audio functions are relegated to a small LED display. The ignition key -- er, "Emotion Control Unit" -- looks impressive but it's no "smart key" (it can't open the doors automatically or start the engine from your pocket), and it's tricky to insert into the dash for a proper engine start. The...well, you get the idea. Those in search of spectacular tailoring and engine fireworks will adore this new Aston Martin. Porsche, however, has not a thing to worry about. Alternative Jet Fuel: The Jatropha Plant?